For their latest fall collection called "Circles", Our Legacy put a bunch of prototypical misfits on the runway or rather on EUR palettes, creating that progressive vibe we know from the Swedish brand. 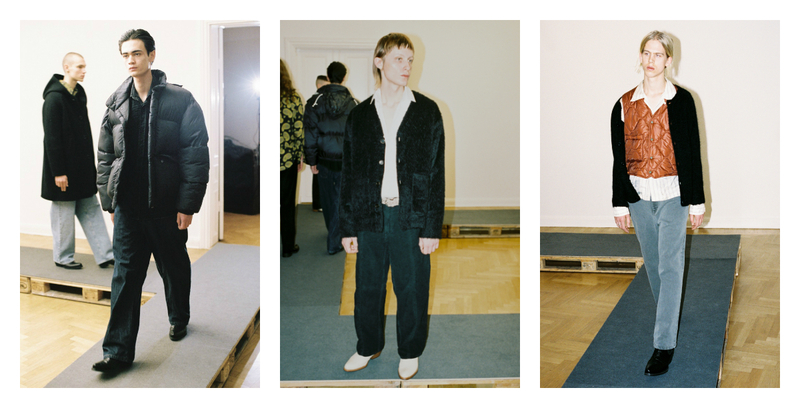 The collection is described as “Lo-Fi Hi-End”, combining influences from workwear and natural materials with more luxurious, sophisticated pieces like the Initial Shirt with its retro Paisley print or the Formal Cut Jeans, both crafted from raw silk. In addition, we are wrapped up in fuzzy cardigans, hand-spun knits and padded vests or jackets, bringing us grungy, geeky 90s back. And when it’s not about material and texture for once, Our Legacy came up with some admirable artsy prints like the abstract Tree. When asked about the current 90s revival, OL founder Jockum Hallin said to Oi Polloi magazine: “Its far enough away now. It usually needs a decade or two to marinate. We who lived it can be nostalgic, youngsters can only fantasize. When I grew up in the 90s, the 70s were cool.” That's how the collection’s title Circles makes perfect sense and we happily indulge in this avant-garde nostalgia.